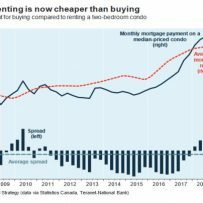 Rents for condominium apartment leases signed in the Greater Toronto Area during 2018 increased by an average of 9.3%, topping the 8.3% growth recorded in 2017 and marking the highest rate of increase since Urbanation began tracking condo rental transactions in 2010. Over the past eight years, condominium rents have grown by an average of 4.1%. On a year-over-year basis, rent growth moderated in the fourth quarter to 6.7%, representing the slowest annual pace since Q1-2017 (nearly two years ago), with the average monthly cost reaching $2,310. In the second half of the year between Q2 and Q4, average rents increased by only 0.5%. Part of the reduced rate of growth can be attributed to a decline in the average size of a unit rented in Q4-2018 to a record low of 709 sf, and a shift in leasing activity to less expensive markets outside of the core. As well, more supply entered the market as the number of new condominium units that completed construction and became registered in Q4-2018 reached its highest level in two years. On a per square foot (psf) basis, rents increased by a record 11.3% annual rate in Q4 to $3.26 psf. The total number of units leased through MLS in 2018 remained consistent with previous years, slightly edging out 2017 (27,327 units) to hit a high of 27,426 units. However, as a percentage of the total stock of condominium apartments, lease activity fell to a five year low of 8.0% last year. The reduced level of turnover was likely a function of the expanded rent controls for tenanted units introduced in 2017 and the increased barriers to homeownership caused by elevated prices, higher interest rates, and new mortgage qualification rules. Low turnover limited the amount of supply in the market in 2018, helping to raise rents throughout the year. As renters faced a tight market in 2018, they began to substitute in terms of both unit type and location. While total lease activity grew 21% year-over-year in Q4-18 across the GTA, leases for studio units (renting for an average of $1,793) increased by 44%. As well, small one bedroom units without dens (average rent of $2,024) saw lease activity grow by 31%. By geography, activity shifted into the outer 416 markets of the City of Toronto, which include North York, Etobicoke, and Scarborough, where leases grew 40% year-over-year in Q4. Average rents in the suburban areas of the City of Toronto at $2,192 were 13% lower than in Downtown Toronto ($2,520). The number of new condominium apartments that finished construction and reached final closing increased to 6,216 units in Q4-2018, the highest level since Q4-2016 and following a period of exceptionally low new supply. This helped to create somewhat more balanced conditions, as the ratio of leases-to-listings declined to 75% in Q4 — the lowest level in three years — with active listings at the end of the year (1,902 units) at their highest point in nearly four years. This trend is expected to continue in 2019 as a record of over 20,000 new condos reach completion. The total number of purpose-built rental apartments under construction in the GTA reached a more than 30-year high of 11,905 units at the end of 2018, rising by 59% from 7,494 units at the end of 2017 and more than twice the level from two years ago at the end of 2016 (5,429). A total of 5,371 purpose-built rentals started construction in 2018, growing from 3,787 in 2017. Looking ahead to 2019, close to 5,000 purpose-built rentals are expected to reach completion, representing the highest level since the early 1990s. Longer-term future supply represented by the inventory of projects proposed for development reached 40,688 units, up from 34,559 units at the end of 2017 and 27,591 units at the end of 2016. The average vacancy rate for purpose-built rental apartments completed in the GTA since 2005 remained low at 0.6% in Q4-2018. The average rent for available units in these buildings grew by 13.8% year-over-year to an average of $3.16 psf, with an average unit size of 776 sf. — Shaun Hildebrand, President of Urbanation.